My name is David Chan. I am from Syosset, New York, and I am a rising junior at Syosset High School. I am interested in mathematics and computer science, and have been enrolled in computer programming classes since freshman year. I am also a Team A Mathlete and represent my school in various competitions. I am also an avid pianist and tennis player. This project demonstrates the coastline paradox that is present in fractals and fractal-like surfaces, such as a coastline. The surface of a fractal curve ultimately has an infinite length; however, measuring it in increments of a certain length will provide the observer with a real measurement. As the length of this increment decreases and approaches zero, the apparent length of the fractal will increase and approach infinity. 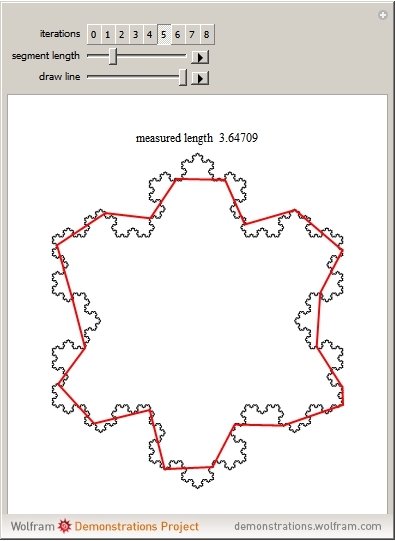 This is demonstrated in this project by using a Koch snowflake, and placing line segments along the edge of this shape. As the length of the line segments are decreased, the apparent length of the fractal will increase.